Group of 8 Chinese Export porcelain table items including a Rose Medallion octagonal plate with central floral and leaf design and 4 floral bands on rim, museum accession number in red on base, 8 1/2" W, late 19th century; Chinese Export plate with central floral spray and floral spandrels along border, museum accession number in red on base, 9 1/4" dia., mid-19th century; Chinese Export plate with central blue and red wreath, outer blue and gold star border with alternating blue floral cartouches and gilt Greek key outer band, 8 7/8" dia. (1 1/2" L hairline at rim) late 19th century; large mug with molded floral ground and large molded cartouche, blue underglaze floral band at rim and handle, central cartouche with figural group in garden and scattered flroal sprays on body, 4 3/4" H (rim chip and 4" L crack through central cartouche) mid-late 19th century; group of 4 Rose Medallion cups with handles, 1 with interior figural scene (repaired) and 3 with varying floral designs, 2 1/2" H. All mid to late 19th century. Provenance: Private Knoxville, TN collection. 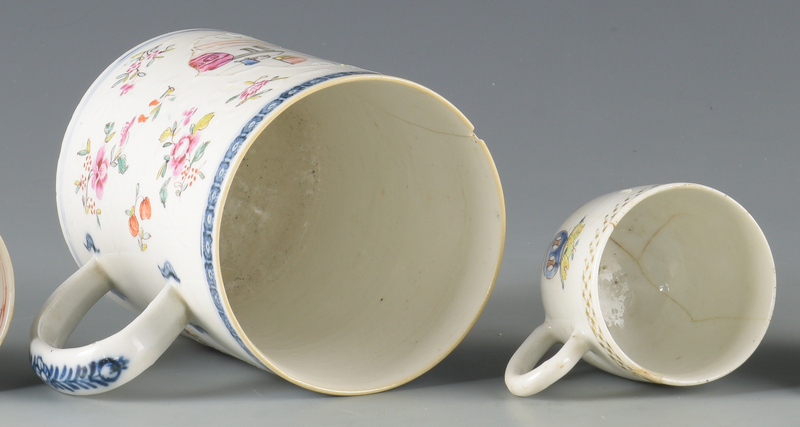 CONDITION: One teacup heavily repaired. Large mug with rim chip and 4" L crack, old rim chips to 9 1/4" dia. round plate. 2 hairlines to octagonal plate. 1 hairline to blue rimmed plate.